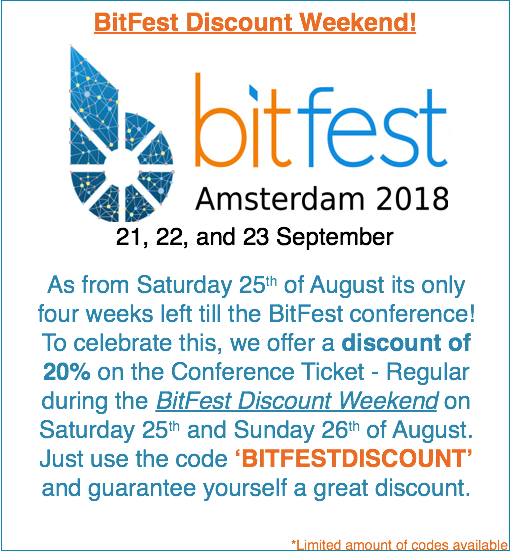 Want a 20% Discount on your BitFest Conference Ticket? Read this! Maybe you already heard about it, maybe not. Upcoming weekend it is BitFest Discount Weekend! Get your BitFest Conference Ticket at a 20% discount if you order your Conference Ticket - Regular on Saturday the 25th or Sunday 26th of August using the code ‘BITFESTDISCOUNT’. Please mind that there is a limited amount of codes available, so don’t wait too long for it. We are very happy to welcome everyone at BitFest Amsterdam!